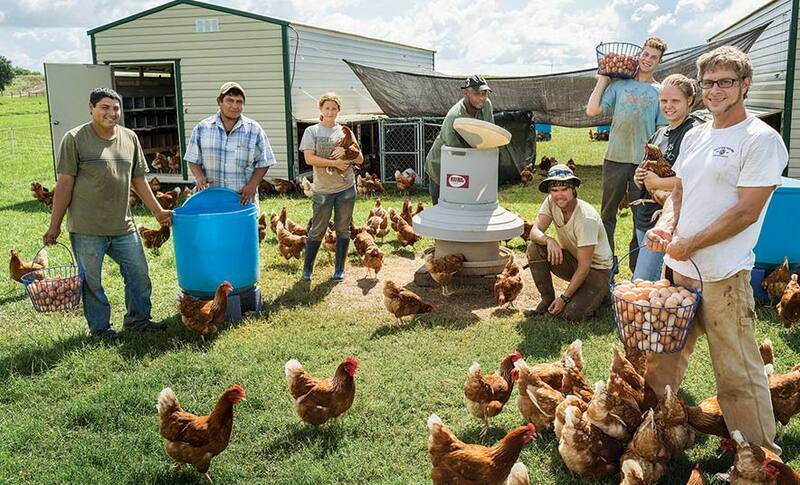 A look at one of America's most interesting farms. The second-best time to arrive at White Oak Pastures, in tiny Bluffton, Georgia, is probably dawn. Sunlight shoots over the pine trees, highlighting a Great Pyrenees sleeping at the door of a hen house. The first cows to emerge from the woods cut trails through the dew. Goats prop their forefeet on fence posts and bleat. It is idyllic. But White Oak is a working idyll, and it is at its best a few hours later, when the largest USDA certified-organic farm in Georgia is up and running. By mid-morning, three cowboys are setting out in trucks to check on 2,000 head of cattle. Half of the dozen field hands are taking water to the 60,000 pastured chickens; the others are headed for the new heritage pigs that just spent their first night outdoors. Meat-cutters are suiting up for the two USDA-inspected abbatoirs. People are tinkering with the solar panels, the biodiesel brewer, the egg-washer, the anaerobic digester that turns discarded blood into fertilizer. 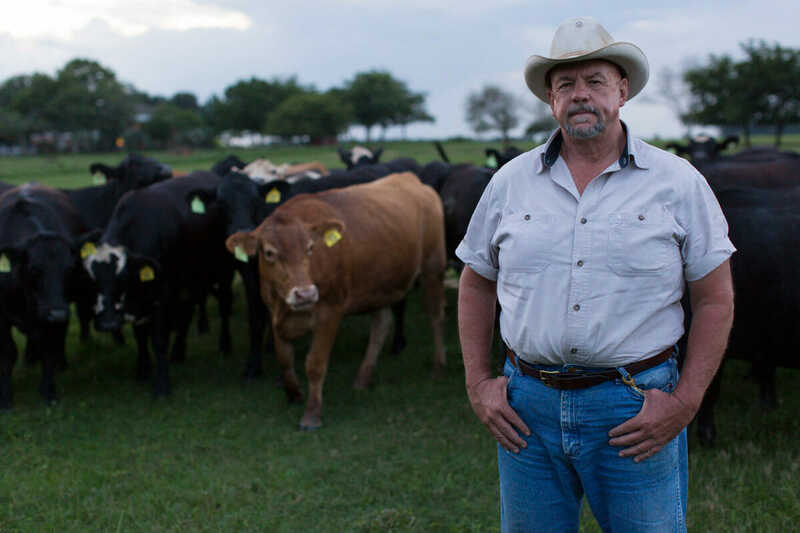 And Will Harris III, 58, burly and goateed and the fourth generation of his family to work the White Oak property, is keeping an eye on everything from beneath the brim of his trademark white Stetson. The men in Harris’s family are important to his story. To run this picture-perfect, hard-working farm, he turned his back on almost everything they stood for. His great-grandfather, James Edward Harris, left college in Macon, Georgia to fight in the Civil War, mortgaging family land and slaves to provision a cavalry unit. When the South lost the war – and the bank took the property and the slaves were emancipated – he fled to Bluffton in the state’s far southwest corner and started a farm to survive. James’ son Will Carter Harris converted the property from subsistence to small-scale commercial, butchering a cow and some hogs and chickens for sale every day. Will Bell Harris took charge after World War II and made White Oak over, vastly expanding the acreage and narrowing the product to nothing but beef calves for feedlots. His son, Will Harris III, started down the same path, with an agriculture degree from the University of Georgia. His initial farm life was filled with silos of feed grain and tanks of fertilizer, “and nothing except cows, and horses and dogs to work the cows,” he recalls. And then, for no single reason but a growing sense of responsibility and heritage, he stopped. 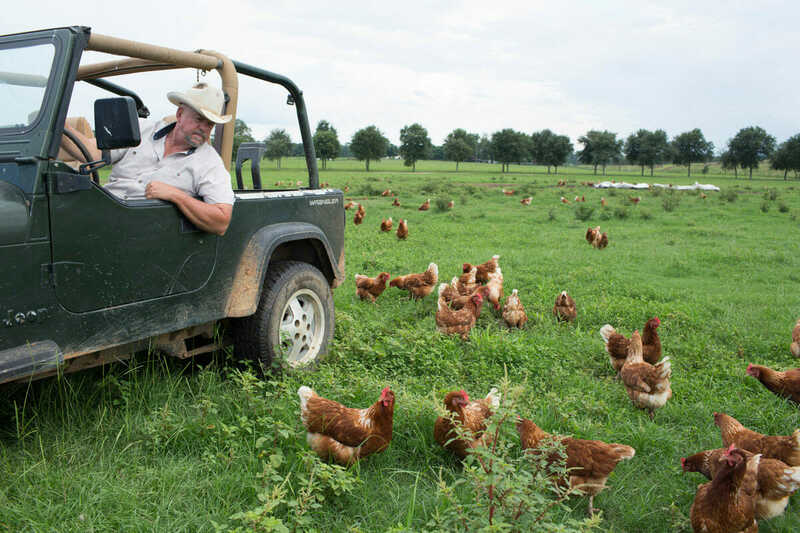 Out of those realizations, Harris, his wife and daughters, and his 85 employees have built a business that sells its grass-fed beef and lamb and pastured chicken to southeastern supermarkets and Whole Foods Markets, to restaurants in Atlanta, three hours’ drive away, and online. The operation is complex and quite large – Harris runs 1,200 owned acres and almost 2,000 leased ones – but from the passenger seat of his 20-year-old Jeep Wrangler, it looks good. After the grass, there are the animals it nourishes. To begin his farm’s transformation, Harris turned all his cattle onto his pastures for the length of their lives; then he added goats and Katahdin hair sheep, to eat the weeds the cattle left behind. 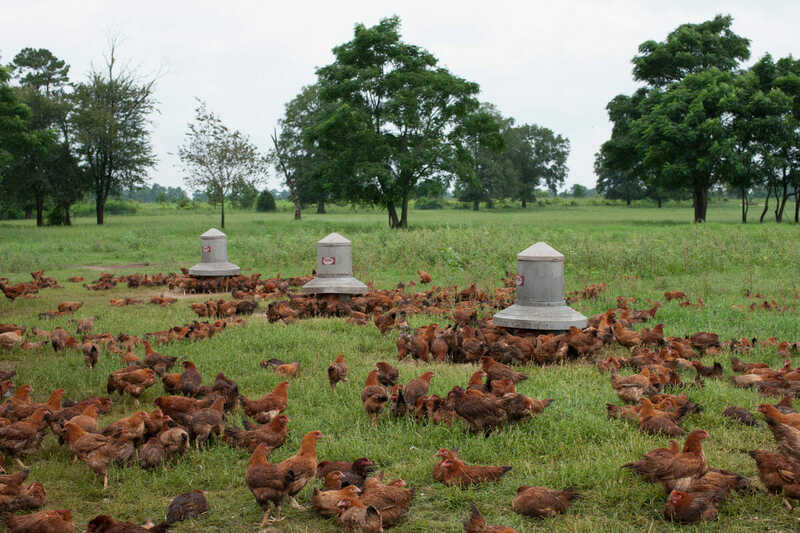 In 2010, he put meat chickens into the rotation, a proprietary cross that he calls “T-Rex Reds.” There are 60,000 on the pastures at any time, pecking and scratching, as well as turkeys, geese, ducks and guinea hens, his favorite. This year, the farm brought in 3,500 laying hens and 200 rabbit does, and then added a dozen Tamworth and Berkshire hogs. And after the animals, there is everything else. Which is a lot: A brooder house, to raise their own chicks. An organic vegetable patch, for CSA boxes; an heirloom orchard, for jams and jellies; shiitake and oyster mushrooms growing on felled oak logs in the woods. There is a dining pavilion, which Harris built to feed his employees lunch, but now is open to the public on weekdays and rented for events on weekends. Impressively, all the disparate parts of the operation circle back to each other, because White Oak labors to be zero-waste. Bones are windrowed to dry out – a soaring column of buzzards marks the location – and then ground for bone meal. Organs and feathers are composted; hides are tanned for rugs. Wash water from the humane, Temple Grandin-designed abattoirs goes to irrigation and litter from beneath the chicken shelters is spread on the pastures when the mobile houses are moved. Trays under the rabbit hutches catch droppings to raise earthworms. 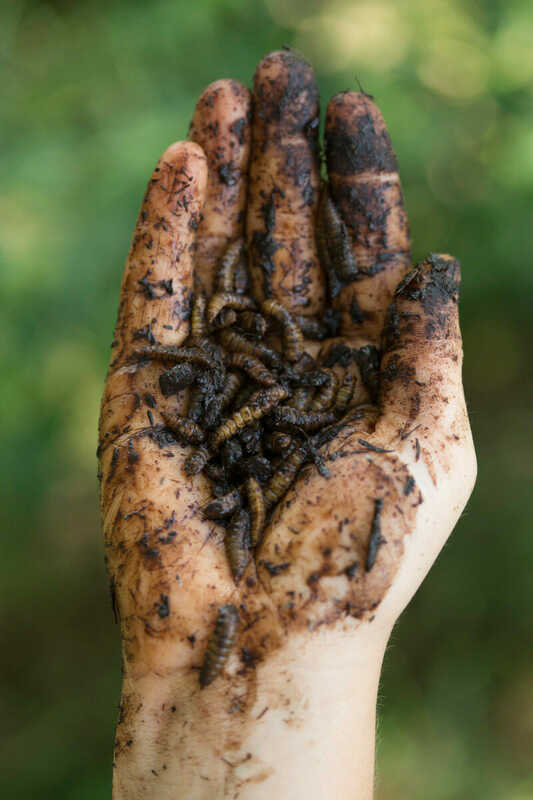 In the greenhouse, a graduate-student entomologist is using slaughterhouse discards to raise black soldier fly larvae for chicken feed. 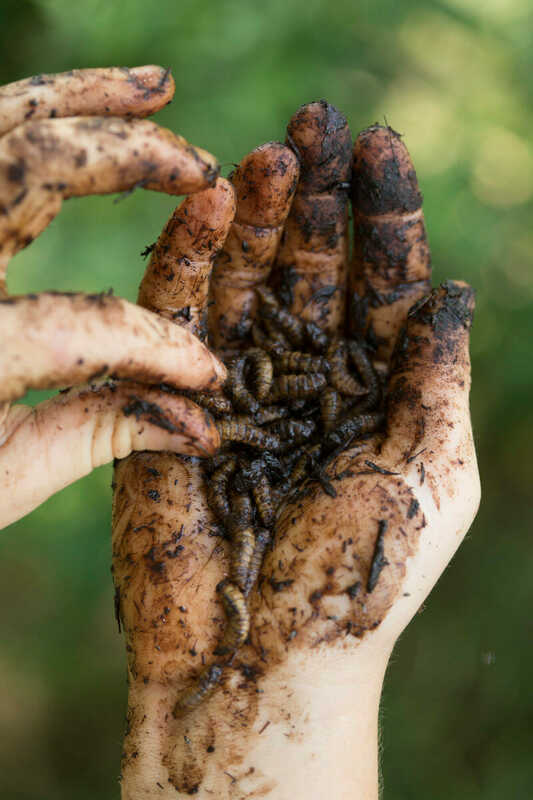 Around the time I meet the larvae, which as they grow inch their way up a spiral ramp sunk into a plastic tub of guts, I feel all the pieces of White Oak fall into place. I realize the Harrises are doing, in a very modern way, what farmers have always done: extracting every dime of value and trimming every penny of expense. In White Oak’s case, the animals, the products, and the relentless innovation on view in every corner have produced a model of sustainability. But sustainability is a paradoxically costly pursuit. 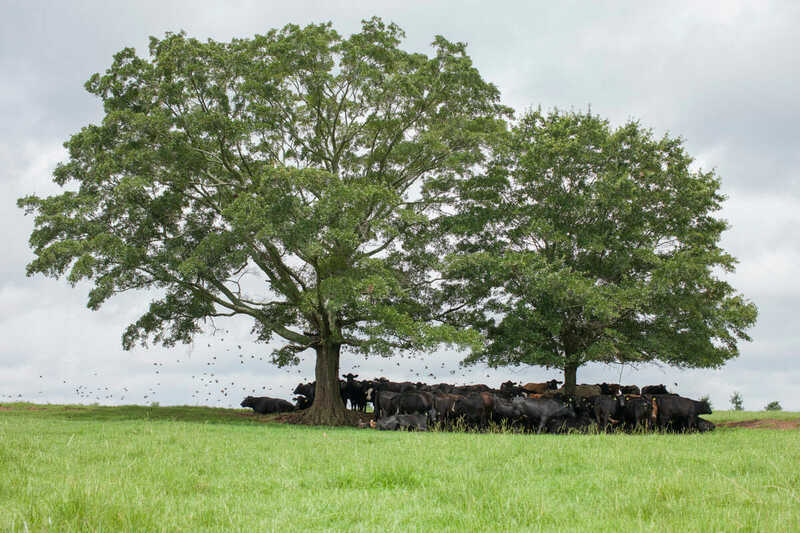 Harris, acutely aware of his responsibility to preserve the farm for the next generation, is paring every profit margin to ensure that his version of White Oak – personal, responsible and organic – survives. If he succeeds, responsibility for the farm someday will pass to his daughters. Harris was the only son of an only son, so as his three girls grew, he fretted that he might have to divide the property and dilute its legacy. Fortunately, he was spared that: Two of the three have elected to take White Oak into its fifth generation. Jenni, 26 and the middle child, already runs the farm with her father. “Nowhere” isn’t much of an exaggeration: the closest gas station is 10 miles away and the closest McDonald’s is 12 miles. Bluffton, the town at the edge of their property, has no lodging, no retail, not so much as a vending machine. Its post office, the only place you can spend money, has reduced its hours by half and may close. Out of Bluffton’s 39 houses, maybe a third are empty. Harris has been buying them when he can, to rent to employees who want to live nearby – he owns six so far – and he recently purchased the derelict general store, which closed in the 1960s with racks of jeans and stacks of paint cans still inside. It’s another illustration of doing whatever is available – and consistent with their values – to keep White Oak afloat. Toward the end of a long day, Harris drives the Wrangler into a tree-ringed pasture across the highway from White Oak’s sheds and slaughterhouses. There are half-grown cattle scattered across the small field, glossy black like Angus but possessing the mahogany glint of Japanese Akaushi and sometimes the dove-grey burnish of Charolais. The sunset light slides under the branches and turns the humid air pearly. Harris kills the engine. The cows, noses deep in red-flowering clover, stop munching and look up. Conventional cattle-raising relies on artificial insemination, which is quick, controlled, and keeps breeds pure. 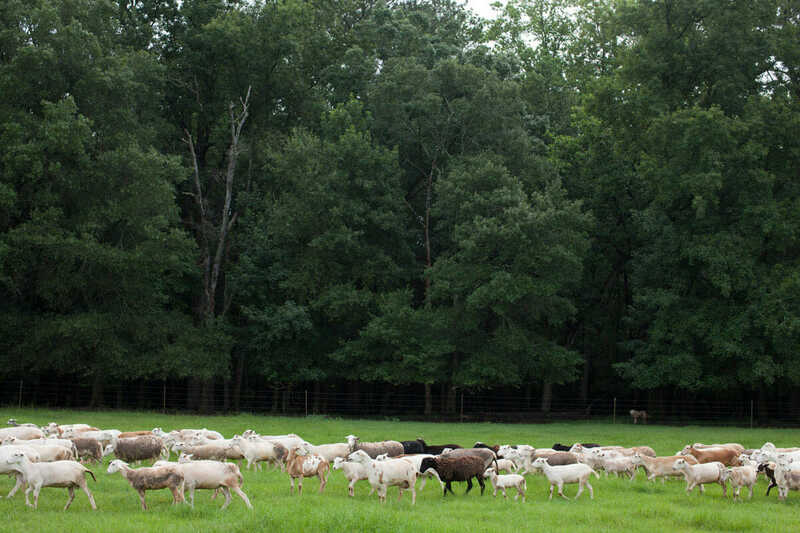 Like so much he learned in his earlier life, Harris disdains it, allowing the breeds in his herd to merge naturally into a unique White Oak mix. Every December 15, he puts 30 bulls into the fields with about 700 15-month-old calves. The cows that get pregnant will stay on the farm, joining an unbroken line of female cattle that stretches back to 1866. The heifers that don’t conceive, and the male calves that White Oak doesn’t need, are raised on grass until the autumn comes. Then they will be driven across the road to the humane abattoir, 30 of them on every working day. While he talks, the calves have circled us. A tail thumps a door panel; a wet muzzle slides under the side mirror, teeth angling to nibble his sleeve. When I look in the back seat, three of them are, in fact, hanging their heads into the Jeep, as if they were listening. As if they realize there is nothing here to fear. He starts the engine. The calves startle, backing off a few yards, and then settle down and drop their heads to graze. 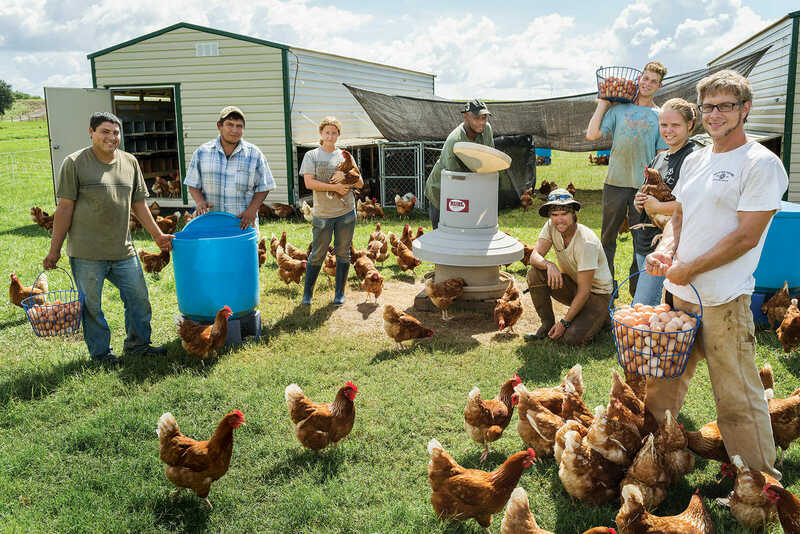 Photo at top: The chicken operation at White Oak Pastures is especially unusual – Harris’ operation is the only one in the country to have both cattle and poultry slaughterhouses on site. The team, from left to right, is: Giovani Bueno, Lori Moshman, Jamal Ghram, Tripp Eldridge, Gil Giancaterino, Tori Smith, Frankie Darsey.